Blend in all ingredients until light and fluffy. Serve at once or cover and refrigerate. To serve, let soften at room temperature. Serve with pancakes, muffins or biscuits. 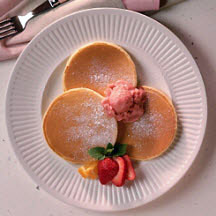 Recipe and photograph courtesy of Wisconsin Milk Marketing Board.